We were discussing the Second Noble Truth, and how we can each notice the way we create suffering for ourselves through clinging, grasping and pushing away our experience instead of holding it in an open compassionate embrace. A meditator said that she was noticing this, but that she hoped that the Third Noble Truth was going to offer the next step: How to fix what we notice. I said that the noticing is all there is. Now this may have been a tad disingenuous because of course the Buddha offers the Eightfold Path (The Fourth Noble Truth.) I suppose it could be regarded as a fix, but I see it more as a circle of light with which we surround ourselves in this practice. Each aspect of the Eightfold Path is a guidepost shedding light that helps us see where we have strayed too far from the core of consciousness and compassion. But the Eightfold Path itself does not fix anything; it simply brightens our way so we can notice. The noticing itself is the one and only step in this process. The minute we try to fix whatever arises in our thoughts, we are caught up in the stickiness of suffering. Our ‘noticing’ is fault-finding and once we have found a fault, like a fissure in a tooth, we want it ‘taken care of.’ We want it drilled, filled and made perfect. This is a reasonable response, a naturally arising thought from our creative brain activity. But in this regard, when it comes to releasing from tight constriction into a spaciousness of mind, you can see that this fault-finding fix-it methodology is more likely to shut us down, make us feel defensive and constrict us, rather than open us to feel more and trust in the process. Thus our desire to fix ‘the problem’ undermines the process. The only tool that is up to the task is this ‘noticing.’ At first our noticing might be rather coarse, full of judgment and attitude, like “Oh there I go again with my big mouth,” or “Yup, I see how angry I get at the least little thing that person does.” Even this has some consciousness to it, some willingness to acknowledge what is happening, or why things are happening as they are, even if we are harsher than we need to be. If this is where we are, we can acknowledge that this is considerably more skillful than not noticing we’ve said something offensive or not noticing our own anger or what seems to trip our trigger. The next step is not to ‘fix’ what we have noticed, but to refine the quality of our noticing. Noticing is polished to a rich sheen through meditation practice, both concentration practice and metta practice. This is why we practice and why it is ongoing. The practice is the way we keep our tool of noticing polished. At first we might think that meditation is a place we go, a retreat we take to get a breather from the hectic life we lead. And if it offers this, that’s lovely, but it is not the purpose of meditation. The core purpose is to develop and refine the ability to see with clarity and compassion whatever arises in this moment. You can think of the knife-sharpener or the silverware polisher performing a vital service. This is a good way to think of meditation because it takes away the allure of thinking it is about having a mind-blowing experience. It takes away comparing one meditation with another. It is just the practice of being as fully present as we can be in this moment with as much compassion as we can manage right now. It is just polishing our ability to notice what arises. There is no bad or good meditation, only this taking the time to do the task, to do the practice. If it creates inner peace, sparks creativity, etc. all to the good. The knife sharpener at his grinder and the silver polisher with her felt cloth also may experience this quieting down of the mind. And all the while the knives get sharpened, the forks get polished and the food is well cut and served. 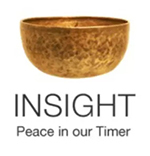 Just so, with meditation practice insight, we polish and refine our ability to notice what is arising in this moment and to hold it with acceptance, wisdom and compassion. And through this practice we can see how the quality of our noticing shifts from, “Oh God, there I go again” to something along the lines of, “Ah, thinking. Noticing a tightness in my jaw when that thought arises. The emotion that arises with it is a sort of_____. Hmmm, the associative images that are arising are ______. Making space in my field of awareness for this to simply arise and fall away. This kind of inner process could be called a dispassionate curiosity. Although the subject is personal, we are willing to allow for the possibility that it is inherently human, that we –though unique and individual in our own ways – are dealing with a universal stream and we are constantly testing the waters. It is not our job to fix the water, but to become more skillful in navigating in it. We can only do this through noticing the nature of the tides, the undercurrents, the weather, etc. We tune in. We notice. We notice everything. So through our regular daily practice of meditation this quality of noticing gets polished up into a tool of self-exploration and expansion, rather than a weapon of harsh judgment that cuts us to the quick and leaves us to find a hole to hide in while we lick our self-inflicted wounds. As you give yourself this gift of meditation, trust that whatever noticing you experience is sufficient for now. Yes, with regular practice, over time the noticing will become more insightful, but judging your state of noticing now as lacking is just another sticky dukkha delivery system, just another tarbaby to get caught up in. So trust the process, trust that as long as we live there is the polishing. This entry was posted in Four Noble Truths, Fourth Noble Truth, http://schemas.google.com/blogger/2008/kind#post, meditation, noticing, Second Noble Truth, Third Noble Truth on September 4, 2010 by Stephanie Noble.